himself to the domestication of all farm animals of the early civilization. Among them small horses, the cow, goat and others. Summarized the legends explain mythically and romantically how the first inventions and developments had been made, and how the first agricultural civilization with script came into being in the yellow river basin of China. From there it would spread into an ever larger territory and would be touched by many cultures and peoples and idea's. Although wrapped in Legends of history, the mentioned archeological finds do underwrite the development of early sedentary civilization in China at around 6- to 5000 years BC. The most well-known find is found on the outskirts of present day Xi'an in Shaanxi Province, a city that would later remain at the center of early civilization and was home to the Capital of Han and Tang Dynasties. Here the Ban Po neolithic village gives a good insight into what the dawn of Civilization in the far east on the eur-asian continent was like. Other sites include those near Yangshao Village in Henan Province, the Shandong Province Longshan Culture finds and even some finds at Wanfujing in Beijing, Hebei Province. its territory, the people, ethnic groups, food, habits and culture all changed numerous of times, to end up as today's customs, China, Chinese people and culture. In this process the Silk Road pathways and the Culture and Technology they carried played a pivotal role. The centralized state, only distantly similar to today's political situation, developed somewhere in the 3rd century BC and was first truly established and developed by the Chin Shi Huangdi and his short-lived Chin Dynasty (221 BC - 207 BC). Slowly a feudal system as we know it evolved, through several stages. As Time advanced, each Dynasty would have its own power-structure and organization, depending on needs, philosophic and technical developments. The better organized, the more powerful militarily. The Chinese Culture and Territory had expanded and united under the Ch'in and although it disintegrated several times, the Chinese Culture Area would keep expanding in all directions. A 2nd Schematic Map of the Silk Road during the Roman Age. In 30 BC the Roman Empire started trading with India, which was already well known from the Conquest of Alexander the Great (+/- 330 BC). In the following 6 centuries the West would Trade with India and indirectly also with China through the Silk Road. The Silk Road only lost its Value after the European Age of Discovery and the Establishment of Maritime Trade Routes with India (16Th Century) and later China. 10Th Century BC: King Mu (Reign 976 BC to c.922 BC) of the early Zhou Dynasty (1122 BC to 256 BC) is the Chinese person known to have traveled on Silk Road. King Mu of Zhou is counted among the most succesful of Zhou Rulers and during his Reign period the surface area of the Zhou State reached its largest size, expanding the territories from the Lower reaches of the Yellow River far into the West and South. Accoring to record, during his reign period the King traveled some 90.000 kilometers, reaching the Kunlun Mountains (Kunlun Shan) in far Western China. Thus began the earliest recorded (and preserved) history of mankind, at least in the East where Chinese and other civilizations started their accumulation of knowledge, wisdom and technologies. Meanwhile, in central and western Asia, the other parts of the ancient Silk Road, other civilizations made their own semi-independent rise. In the far west, around the mediterranean Sea, Greek Civilization had already made it first brave steps, the highpoint of their civilization in the first millenium BC laying foundations for all of western civilization. (1000 BC - 206 BC)". READ ON IN: Chronology Silk Road History (5) "Song Dynasty, Mongolian Empire and Rise o/t Ming (906 AD - 1644 AD)". 206 BC -220 AD : In the year 221 AD the Qin Dynasty is obliterated by a nationwide uprising. The Chinese Nation is shattered and spilt by conflict but reunited into the realm of the Han Dynasty. Having seen the rise, fall and failure of the first Great Wall of China the Han are plagued and dominated by nomadic neighbors the Xiong-Nu. During the Han Era the Chinese Nation will rise and reach unprecedented size, defeating the northern neighors and opening up trading connections to Central Asia and the West. Thus, the Silk Road is founded sounding in a new Era of International contacts and prosperity. East meets West and Vice Versa, fabulous goods, treasures of knowledge and culture are exchanged. READ ON IN: Chronology Silk Road History (3) "Han Dynasty (206 BC - 220 AD)". The Silk Road was a transcontinental trading path connecting Asia, Entire, North Africa and Europe. Countries connected through the main pathways of the land-bound Silk Road are China, Kyrgyzstan, Afghanistan, Pakistan, Uzbekistan, Kazachstan, Turkmenistan, Tibet, India, Syria, Iran, Iraq, Egypt (Cairo and Alexandria), Turkey, Italy (Rome). Apart from the Main Route there are several parallel pathways traversing North around the Caspian Sea and along the Eastern Shores of the Black Sea. Today these territories include the countries of Azerbaidjan, Armenia (ancient part of Persia), Georgia and parts of Ukraine and Russia. In the South-East ran another minor Silk Road pathway, best identified as the South route of the Silk Road from China to India. This trade route included the Nations of China (Yunnan Province), Myanmar (Bhurma), Tibet (Autonomous Region of China) and Qinghai Province. The Silk Road inside of China and the Chinese Empire, which was established during the Wu Di Reign of the Han Dynasty and thus active from the 2nd century BC onwards, led westward from the Han Dynasty and later Sui Dynasty and Tang Dynasty capital at Ch’ang An (near Xi'An), via Lanzhou where the Yellow River was crossed into the Hexi Corridor of current day Gansu Province. In the Hexi Corridor all Pathways had to pass through the JiaYu Pass, since 1372 AD the location of JiaYuGuan Fortress on the Great Wall of China. From JiaYuGuan the route led on to Dunhuang (Tun-huang) at the edge of the Taklamakan Desert. At Dunhuang the Chinese Territory ended and the pathways of the Silk Road diverge to the North and South. The North pathway leads through Jade Gate (Yu Men) past Lop Nor Lake to Turpan and further along the Tarim River Basin and the Northern Edges of the Taklamakan Desert to Kashgar. Equally, the South Route out of Dunhuang leaves out of Sun Gate Pass (Yang Guan) to head south along the Cherchen and Keria Rivers to reach Khotan and then Kashgar along the South Rim of the Desert, while keeping along the North Rim of the Tibet-Qinghai High Mountain Plateaux. The two pathways out of Dunhuang, last bastion of ancient China, reunite at the City of Kashgar in far western Xinjiang-Uygur Autonomous Region. Kashgar today, is the westernmost destination on the Silk Road in China. points at Damascus, Palmyra and Alleppo (in current day Syria). Other Mediterranean Ports such as Alexandria and Tyrus likewise served as shipping points for Silks and other goods (See Maps of Silk Road!). After the days of the Chin, the earliest Great Wall of China finally enabled successive Dynasties and Chinese peoples to conquer the West and thus open up the famed Silk Road, which would be the economic life-line for further development and contacts with the world. The silk road was won by the Han Dynasty, in a long and protracted conflict with the Xiong-Nu (later dubbed "the Huns") Tribes to the North in Mongolia. The Silk Road was developed further by the succeeding Dynasties, leading to the High Point of Trade and Cultural exchange during the Tang Dynasty (618 AD - 907 AD) Era. Ultimately, the Silk Road would remain crucial to Chinese Development, Culture and Economy until roughly the mid 14Th Century, when development of international overseas trading routes (the Maritime Silk Road), mutal hatred with Central Asian Tribes combined with the political situation in self absorbed Ming Dynasty China ended trade on the Silk Road by Imperial Decree. 1717 AD: Dzungars of East-Turkestan invade the Nation of Tibet. Soon they start destroying Tibetan Monasteries and Cultural Treasures drawing outrage among the Population as well as a swift response from the nominally Buddhist-Lamaist Qing Court in Beijing. In 1718 AD a First assault by Qing Armies against the Islamic Dzungars in Tibet is repelled and defeated. READ ON IN: Chronology Silk Road History (6) "Manchu Empire, Qing Dynasty and the Silk Road (1644 AD - 1800 AD)". 1644 AD - 1860 AD: The Qing Dynasty Interbellum - Regaining the West. It would go too Far to discuss all the details of this story, but finally Mankind could travel and Trade more widely. In the next period life-stock, gems, woven items and agricultural tools moved up- and down from West to East and Vice Versa. Notably, among the first things to be traded was the knowledge of Bronze Melting and the primitive Art of Working. Whichever way it was, during the earliest days of Civilizations in China, the western Hexi Corridor - China's Gateway to the West and a vital pass on the Silk Road - was already a vital conduit of People, Wares and knowledge. It was probably even before the very beginning of the Shang Dynasty Era that the existance of an Oasis Lake at JiaYuGuan underneath the Qilian Shan provided for the abundant watersource need to sustain an agricultural enclave or settlement that could support travelers from East and West. 1000's years later JiaYuGuan would become the End of China and the location of the Westernmost Fortress on The Great Wall of China (Chang Cheng), built in protection of the Chinese Heartlands as well as the vital economic artery of the ever developing Silk Road land trading paths. Only when primitive script was invented, with some signs still recognizable in today's chinese caracters , the earliest histories started to be recorded. Before this period not very much is known, other than through archeological finds and studies. There are however many legends of the period before script was developed, legends that the Chinese themselves regard as part of their true historic heritage. According to legend, the foundations for Chinese civilization and what is now known as the Xia Dynasty, were laid by the Three Emperors and Five Sovereigns. Among these is the well-known Yellow Emperor, a leader an scholar also said to be responsible for the earliest foundations of traditional chinese medicine and who's Queen is said to have been the first to raise silk-worms and develop a primitive silk industry. Shen Nong, another of the Emperors is said to be responsible for creating the first primitive farming tools, such as the hoe and the wooden-plow. Whichever way it was, during the earliest days of Civilizations in China, the western Hexi Corridor - China's Gateway to the West and a vital pass on the Silk Road - was already a vital conduit of People, Wares and knowledge. It was probably even before the very beginning of the Shang Dynasty Era that the existance of an Oasis Lake at JiaYuGuan underneath the Qilian Shan provided for the abundant watersource need to sustain an agricultural enclave or settlement that could support travelers from East and West. 1000's years later JiaYuGuan would become the End of China and the location of the Westernmost Fortress on The 10.000 Li Great Wall of China (Wan Li Chang Cheng), built in protection of the Chinese Heartlands as well as the vital economic artery of the ever developing Silk Road land trading paths. READ ON IN: "Chronology o/t Silk Road (7) Modern History of the Silk Road \Part 1 (1800 AD to 1950)". This Art, beforehand developed in Western Civilizations, but as yet unknown in the Far East, is thought to have spread from Central Asia into China along these Routes. Archeological finds on Mummies of apparent European Descent in the Desert Graves in Xinjiang Autonomous Region (Khotan , Cherchen, Loulan and others) strongly suggest such an event. While in the east the first Chinese and other sedentary civilizations arose and developed (as well as equally noteworthy several nomadic civilizations), in the west in south west Asia similar events had occurred. Thus, as the Wilson Chronology of the History of Asia and the Pacific records, while the Yanshao Cultures blossomed along the Yellow River, the city of Ur was established in southern Mesopotamia by a people today identified as the Sumerians. The Sumerians were a sophisticated people who developed their own language and in time invented script. YouTube Video: Caucasian Mummies found In the Tarim River Basin along with Bronze Objects. To be exact, the Bronze Age in Asia started in China around 1500 BC. The Birth of First Walled Cities was seen in the fertile Chinese Plains of Shanxi- and Shaanxi Provinces a first version of script appeared and for all practical purposes is was the beginning of recorded history in China (The Shang Dynasty Era left inscribed sea-shells and bones, evidence for the invention and development of primitive script in this Age). In the succeeding period the earliest Chinese civilizations were primitive societies which had just developed agricultural skills and had invented such primitive tools & pottery. The first ever agricultural crop grown in eastern Asia was probably millet which could provide only a very limited sustainance. However, as was proven by an archeological find done of Pentoushan in current day Hunan Province of China at around 7000 BC, the first rice crops were grown in the fertile Yangtze River Delta, for the first time leading to a surplus and the growing of the population to unprecedented levels. From these groups of people, the first complete societies only arose at around 5000 BC. In China these societies/tribes were located in the lower reaches of the Yellow River, counted many more citizens and spawned the first true villages and cities. Similar to early civilizations elsewhere in the world, they knew of no script at first. They did however know musical instruments the knowledge and use of which had somehow spread throughout various "neighboring" cultures, also around the year 7000 BC. The instruments known at the time where zithers, friction drums, bamboo and reed flutes, horns and a various primitive forms of what today would be called a Jews Harp. Clearly, eventhough communications are held to have severely limited, somehow -even it was on foot- people did travel around, and their habits, culture and inventions intermingled, spreading about. known today as the white temple, stood upon a tall mud towering platform, creating for the first time the feature that would later become known as the zigurat. At around the same time, people started using "name seals", which served as signature stamps useful for concluding deals and sealing promises. Although, there was no script yet, these signature seals would become the elements that allowed for the emergence of script. As buffs of Chinese Culture will realise, until fairly recently, name seals would later become a basic feature of Chinese (litetary) culture, remaining in style until fairly recently. Even today, tourist shops will offer name seals to the many first time visitors to their nation as a souvenir gift. At around 6000 BC, the (likely) ancestors of the Sumerian people of the city of Ur had already invented the art of bronze casting. It was one of the elements that brought the Sumerians their successes in war. By 4000 BC the Sumerians were able to smelt gold, while in a similar process of development they developed the first kiln and according heated and hardened pottery. Only some 500 years later, the first wheel has been invented and the first carts, often drawn by oxen, start plying the pathways that can begin to form into roads. by 3000 BC the Sumerians are known to have operated two wheeled carts, which were used for transport and as primitive chariots in battle. The Gift of the Knowledge of Bronze Working, which was probably first invented in today's Anatolia region of Turkey, would travel onwards to the East where in the succeeding period Han Chinese Civilizations based in the Yellow River Basin would develop the art of bronze working as never seen before. Although starting out late, the Chinese would become true masters of Bronze Working. Traveling eastward carrying the knowledge of bronze working across the width of the contentent were groups of Indo-European people, whose languages had by then split into various local versions. These local languages such as Armenian, Persian (Iranian) and Indic would become the roots of languages that would be found across the Asian continent in later times (and are still found today). 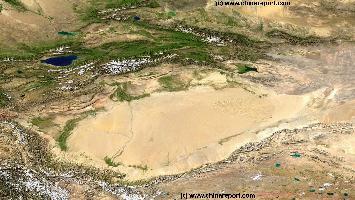 As has now been well proven, one such group of Indo-Europeans traveled from west to east to end up in regions that are today identified as the Tarim River Basin and the Taklamakan Desert. Having arrived in what was then a much more hospitable region than today, these people apparently settled establishing the civilization of the Tocharians. Long lost to human memory, the existence of the Tocharians now well established through numerous fascinating archeological finds was already fairly advanced, making use of woven clothing, various instruments including copper items and cultivating among things marihuana for medicinal or spiritual use. Around 2205 BC the Xia Dynasty of the Yellow River Basin saw the rise of the first Cities in History. Although very modest in size, the cities knew systematic agriculture and large irrigation works were initiated to till the land and prevent floodings. - Around 2900 BC the so called Longshan Culture developed in the middle regions of the Yellow River. This culture continued on to around the year 1500 BC. - By 2500 BC: worked copper artifacts appear in China and in the Indus Valley of northern India (and Pakistan). Not much later copper implements are widely used as tools of war (It is unclear if the copper was smelted or hammered). - By 2500 BC Chinese artists start crafting jade into increasingly immaculate objects and ornaments. Mostly devout of Jade themselves, as the culture of Jade developed in Chinese Cultures they would look increasingly towards Central Asian lands. In later history much of the jade supplied to China would be important overland via the Silk Road(s) from Central Asian nations and territories. 1459 BC: In the 22nd Reign of King Thutmose III (sometimes read as Thutmosis or Tuthmosis III, Thothmes in older history works, and meaning "Thoth is born") the sixth Pharaoh of the Eighteenth Dynasty of ancient Egypt, who's territory incorporated parts of the southwesternmost parts of the pre'-silk road, the frightening appearance of a comet was observed and duly recorded, as it was the most astounding sight the world had ever witnessed. According to records of what was to be the first ever recorded, dated and preserved comet sighting in human history; "a brilliant disk much larger than the full moon" was seen, adding that it was “a marvel never before known since that foundation of this land (Egypt).” As revealed through the 1973 unearthing of Mawangdui Silk Texts of the Western Han Dynasty (206 BC - +/- 6 AD), Chinese astronomers, were apparently already meticulously recording celestial occurrences for astrological purposes. The ancient Mawangdui Silk Texts depict the comet as one of the largest ever observed. Not only did it fill a large part of the sky, it had an astonishing ten tails. (The biggest comet observed since the birth of modern astronomy, De Cheseaux’s Comet of 1744, had only seven.). Although the dating of the Reign of King Thutmose III is disputable, clearly the Chinese observations date to the same year, creating an additional timeline. The following Chinese of the Shang Dynasty and Zhou Dynasty (1121 BC - 255 BC) were the first to develop bronze-working to an already high level and they were the world leader in ceramics from their earliest invention. As is held by historians today nomadic hunter gatherers spread through northern regions of Asia as early as 20 thousand years before Christ leaving sparse graves with distinctive bone engravings on their trail across the continent. No trails of human inhabitance at this early date have (so far) been found further east. Currently, it is held possible that humans reached north eastern Asia earlier, however currently the earliest signs of inhabitation in (north-) east Asia are dated to around 15 thousand years B.C. At around the year 10 thousand B.C. the global climate started warming, gradually bringing an end to the Ice Age and allowing for further human migration to no newly inhabitable regions. Around this time settlements start to appear in east Asia. Arguably, the occurrence of settlements is often linked to the invention of agriculture, thus theorizing that maybe at this time the first agricultural production had taken place with at least a part of the population settling down and moving into an (semi-)agricultural type of lifestyle. None of this is sure at this time. What however is sure that in the next few 1000 years several types of animals were domesticated, among them pigs, chickens and dogs. Agriculture is said to have been adopted around 6000 B.C. at the latest, thus for the first time allowing for the rise of an organized civilization. And so, today still mostly according to legend, it occurred. Its first successes usually attributed to the appearance of vague figures such as Fu Xi, Nu Wa, the Yan Emperor and most notably the Legendary "Yellow Emperor" who -among things- invented agriculture and who's wife supposedly invented the cultivation of silk worms, officially the origins of China and the Chinese go as far back as 5000 years before Christ, or more. Archeologically, the official history as recorded by the Han Dynasty (206 BC - 221 AD) historian Sima Qian (145 or 135 BC - 86 BC) is backed up by abundant evidence of inhabitation found in regions throughout the Peoples Republic of China dating to in the era of 10.000 BC, at the end of the new Stone Age (Neolithic). Although there are many more, such sites and according evidence and stone inscriptions can be found at Helan Pass (Sangguankou) in Ningxia Autonomous Region, and along the Northern Mountain Borders of Xinjiang-Uygur Autonomous Region, in current day Gansu Province as well as in Mongolia and the Inner Mongolia Autonomous Region. In these early ages the Western Regions of what today is the People Republic of China were already populated, as well documented archeological finds have proven. These were however very primitive and dark tribal times, with men living in close contact with nature as hunter-gatherers. Overall, the population was very sparse, there was only a limited use and knowledge of agriculture and thus there were no cities. Small groups of People moved about on Foot. 3000 BC : According to various archeological finds, among which murals and depictions, as well as ancient silk cloth and threads derived from Tombs and Mummies and ancient burial jade inscriptions, the earliest cultivation and weaving of Silk takes place at around 3000 BC. Possibly already in the Late Stone-Age, around 10 to 8000 BC primitive peoples in Eastern Asia already knew how to derive fibers from the Silk Worm, however this reamins uncertain. Silk Reeling and Silk Weaving were original Chinese Inventions. 4000 BC : In Chinese Folklore and Saga, around 4000 BC one of the 3 Old Sages, the Yellow Emperor, is said to have introduced Silk Worm cultivation by use of the Mulberry Tree and taught the Chinese People how to make Silk. 2000 BC - 700 BC: Emergence of the Bronze Age Erlitou (1900 BC - 1500 BC) and Erligang (1510 to 1460 BC) Cultures along the Middle and Lower Reaches of the Yellow River in China. They create surprisingly advanced bronze works including ritual Jue Wine Vessels. 221 AD -265 AD : In the year 221 AD the Han Dynasty finds it end in violence. The Chinese Nation is shattered and spilt by conflict by feudal aristocratic families preceeding the Period of the “Three Kingdoms;” China gets divided into rival dynasties. After many centuries a new Central Authority arises in the Sui Dynasty, on who's sucess the Tang Dynasty rises to conquer and venture far beyond traditional borders once more. READ ON IN: Chronology Silk Road History (4) "Three Kingdoms, Sui and Tang Dynasty (221 AD - 907 AD)". READ ON IN: "Chronology o/t Silk Road (8) Modern History of the Silk Road Part 3 (2000 AD to Present)". In this modern history of the Silk Road, the turn into the modern era is taken at the beginning of the 19th century, specifically the Reign of the Daoguang Emperor of the Manchu Qing Dynasty. For browsing convenience and faster loading speed, the modern history of the silk road has been divided into two parts, the second part representing all relevant historic events along the silk road or concerning the silk road in the new millennium, since the year 2000. READ ON IN: "Chronology o/t Silk Road (7) Modern History of the Silk Road \Part 1 (1950 AD to 2000)". 1600 BC - 1100 BC : Complete knowledge of "Silk Technology", farming, extraction and weaving are available during the Shang Dynasty Era. 1600 BC: In the western parts of the pre'-Silk Road, the Hittite Empire Rises in Central and Northern Anatolia and Asia Minor. Reaching their highpoint in the 14th century BC with the capture of large parts of the Levant (current day Lebanon and Israel) as well as Mesopotamia (Iraq), the Hittites subseuqently succumb in what has been dubbed the (Late) Broze Age collapse, a mysterious historical period in which many great civilizations across Asia (and also on the American continent) will lapse in violence, chaos, warfare and general disorder, greatly reducing trade, literacy and cultural exchanges across the continent. In western Asia many cities are destroyed or abandoned.